Sinn Fein has given "a cautious welcome" to the Loyalist Volunteer Force move to stand down. The splinter loyalist paramilitary group said the decision was taken in response to IRA arms decommissioning. The LVF has been blamed for more than a dozen sectarian killings since it was founded in mid-Ulster in 1996. SF's Gerry Kelly said: "Given the LVF's history, nationalists and republicans will of course be cautious of anything being said or promised by them." He added: "This grouping has a history of sectarian violence, murders and widespread drug dealing, so with relation to the LVF, it is very much wait and see." On Sunday, a group of church and community figures said a loyalist feud between the LVF and the rival UVF was over. A statement by the LVF said that the move to stand down its so-called military units would take effect from midnight on Sunday. The LVF was formed by Portadown loyalist Billy Wright after the Ulster Volunteer Force (UVF) leadership stood down his unit in 1996. 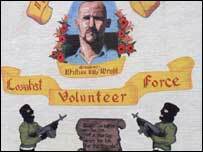 Wright was shot dead in the Maze prison by republicans in December 1997. On Sunday, the Reverend Mervyn Gibson said the loyalist feud, which claimed four lives in Belfast in July and August, had "permanently ended". He said the group of church and community figures had been holding mediation talks "for some time". The end of the feud had been widely expected, with no fresh violence happening since August. The Independent Monitoring Commission had blamed the UVF for the four summer murders. A special report in September by the ceasefire watchdog said the LVF carried out two murder bids, but their violence was mainly a response to UVF attacks. The report on the loyalist paramilitary feud led Northern Ireland Secretary Peter Hain to declare the UVF ceasefire had broken down. Speaking in the House of Commons, Mr Hain said he welcomed the LVF move. He said there should be a complete and permanent end to all paramilitary activity and also welcomed Sinn Fein President Gerry Adams using the phrase "the war is over" - saying it was a further sign that things were moving in the right direction. Ann Trainor, whose son Damien and his best friend Philip Allen were murdered by LVF gunmen in County Armagh in 1998, said she found the move hard to believe. "Both sides are just as bad," she said. "There is a lot of evil and jealousy. It is hard to believe. The evil will never quit - you can see it every way." The mother of Catholic taxi driver Michael McGoldrick murdered in 1996 said she believed the move offered some glimmer of hope for a better future. "It is a wonderful day. It is a start and we should really grasp it," said Bridie McGoldrick. She added: "That is not just from the people on the ground - I think the politicians have to grasp it as well and we have to sit down and talk." 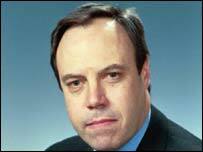 DUP North Belfast MP Nigel Dodds said he "warmly welcomed" the end of the feud. "Communities have been set on edge and put into turmoil. I pay tribute to those who have worked so hard to bring this resolution about," he added. 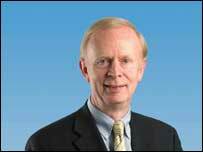 Ulster Unionist leader Sir Reg Empey said the move was another positive development in the political process. "Yesterday's announcement that the feud is over, last week the UDA sent a delegation to see the decommissioning body and Gerry Adams, for the first time allowed the words 'the war is over' to pass his lips," he said. The SDLP's former assembly member, Brid Rogers, said many people in the Upper Bann constituency had been murdered by the LVF. "The litany of atrocities in this area is awful and it is too late for all those people too late for them, too late for their families."